Enjoy a relaxing stay at the Paxton MLV, Paris, only 10 minutes away from Disneyland Paris and 5 minutes away from the Valle d Europe shopping mall, La Vallee Village outlet shopping and the Sealife aquarium. 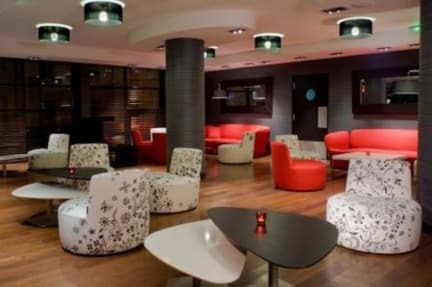 The hotel is 30 minutes away from Paris city centre and easy to reach by direct RER train connection. Paxton Residence Hotel offers ideal accommodation for tourists and business travellers, thanks to the nearby RER station of Bussy Saint Georges (2 minutes away) and the TGV station of Marne la Vallee Chessy (10 minutes away). The hotel offers 232 modernly decorated rooms that are spacious and comfortable. The rooms feature comfortable bedding and a kitchenette. At the reception desk of the hotel you can request to have crockery and cooking utensils in the room at an additional charge of 10 Euros per stay. Furthermore, the rooms have an en-suite bathroom and modern room facilities such as a TV with satellite TV, wired Internet connection, a free safe, fridge, welcome tray and hairdryer. Indoor swimming pool is available on a free access everyday from 7h to 22h. The Paxton MLV offers, 20 bowling lanes, 13 pool tables, 6 virtual reality games, an Italian restaurant open 7 days for lunch and dinner and a lively bar.